If you’re familiar with stock trading or have been following our series of guides on demat accounts, you may already know about trading accounts. For the uninitiated – a trading account is essentially used to place buy and sell orders on securities. A demat account, on the other hand, is used to hold onto your stocks but you will be unable to trade through a demat account. A trading account is practically your only option for seamless trading in the securities market. If you’re just starting out, check out a previous post where we’ve covered trading accounts in detail. Now, the question is: how can you get started with a trading account? Similar to the demat account opening process, this form will, in turn, require you to submit a few documents as proofs of your identity, address, income and bank account validity. You don’t have to worry about attestation and taking printouts if you have your mobile number linked to your Aadhaar card. You can then upload your documents directly to the portal. As a trader, you can bear in mind that the faster you verify your documents the faster you’ll be able to start trading on different segments. After having selected your brokerage firm and understanding the trading account opening process, you’ll need to fill out a registration form that is known as the KYC Form in the industry. Similar to the demat account opening process, this form will, in turn, require you to submit a few documents as proofs of your identity, address, income and bank account validity. Demat account holding statement with a depository participant. In case you receive salaried income – salary slip, and a copy of Form 16. Proof of a corresponding bank account: Your bank account needs to be verified to check if it is valid and in working condition. You can submit one of the following two documents for the verification process. A Cancelled Cheque of the bank that you wish to link with your trading account. Make sure that the canceled cheque has your name is clearly Printed. Bank passbook of the respective bank along with the IFSC Code. 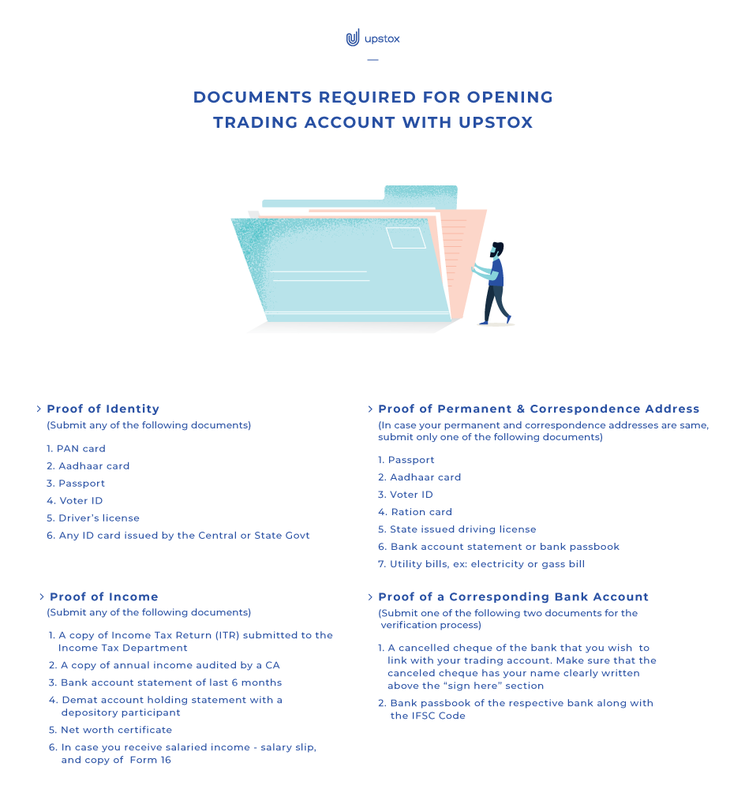 As of now, you might have gotten an idea of the documents you have to submit to complete the procedure of getting started with a trading account. If you’re unable to produce the originals of these documents for verification, your submissions will need to be mandatorily attested by a Notary Public or Gazetted Officer. Submitting Online via Your Aadhaar Card? You don’t have to worry about attestation and taking printouts if you have your mobile number linked to your Aadhaar card. With our Aadhaar-based eKYC, it is possible to verify your identity and address proofs digitally and proceed without having to deal with all the paperwork that trading account usually involves. Open trading account now! Since a trading account is indispensable when buying or selling any type of securities (stocks, ETFs, currencies, etc) – you’re going to have to open one before you begin trading. This, of course, would require you to fill up a registration form and submit some important documents – such as an ID proof, an address proof, a proof of income, and a proof of your bank account. You can either submit printouts of these documents and send them to your broker or can skip all this paperwork and register yourself online.